Entering the mystical world of wine tasting can be quite daunting. We are all familiar with the image of landed gentry sipping on claret, discussing how 1961 was a great year for Bordeaux or how super 1990 red Burgundy is drinking at the moment. Sniff, Swirl, Sip and Slurp! Unfortunately, top wines from Bordeaux and Burgundy are out of reach of the average wine lover on the street. Thankfully there is an exciting new breed of talented, vibrant and enthusiastic young wine makers out there producing some dazzling, enticing, scrumptious wines that, whilst always respecting tradition, are pushing the boundaries of wines styles, rewarding the wine lover with an amazing variety of wines that not only deliver great drinking, but also amazing value. But how do you decide if you like a wine? How do you decide if the bottle you’ve picked up is going to impress your new flame during a dinner pairing? How do you know that when your sommelier friend comes over for a BBQ, you’re going to be able to assuredly pull a bottle from the wine rack that it is going to blow their often-picky socks off? If you follow these simple steps hopefully we can help to break down some of the myths and mystiques that lie within the bottle that you’re about to pull the cork out of (or more often twist the cap off!). This will allow you to savour your bottle, and give yourself a high five on the other side for making such a great choice in your vinous selection! Wine tasting should be fun. So don’t get too hung up on it. Enjoy it! Lesson one over. If you fail to prepare, prepare to fail! Make sure your wine is at a good temperature to taste. As a general rule of thumb, whites should be tasted a little warmer than you would normally serve them, while reds tasted at room temperature should be fine. There’s nothing worse than tasting a soupy-warm red. Similarly, if your white is too cold it will mask all the lovely aromas hiding within. Choose a nice bright room or space in your house. One of wines loveliest traits is its colour. Try and have something white at hand so you can easily see how vibrant the wine appears. A simple piece of white printer paper does the trick nicely! Decent, clean glassware is also key to any tasting experience. We’re not suggesting getting out your finest crystal (if you do, give it a good air out first!) however a good glass goes a long way to enhancing a wine’s taste. According to one study, the shape of a glass can actually influence the way we perceive taste. Taking cues from this, it’s not a stretch therefore to say that a more elegant glass may actually give you the perception of the wine tasting better. Pour a splash of wine into your glass (a quarter to a third of a glass is sufficient). Hold your wine against your piece of paper. Have a quick look, as the colour can give you some indication of what you are about to taste. A white or sparkling wine with a lemony-green tinge may suggest that the wine is quite youthful and vibrant. A deeper yellowy-golden colour might suggest some bottle age or perhaps some oak ageing. With reds, a vibrant pinky-purple suggests the wine is going to be full of lovely crunchy primary fruit. Looking from above the glass, if you struggle to see the stem through a deep purple core (the middle of the wine), you can probably expect the wine to be much richer, full-bodied and commanding. Unlike whites, red wines tend to lose their colour with age. If the edge of the wine has hints of the kind of brick red/orangey colour you see on beautiful old buildings, you may be about to awaken your senses with a wine that has seen a bit of bottle-ageing. Rules are there to be broken, so don’t read too much into it if your eyes and your palate don’t match. It’s time to get serious. Mastering the swirl can take some time to get the hang of but shouldn’t be feared. The revealing nature swirling brings to your wine is worth the first few mishaps. Swirling helps to introduce air into the wine, encouraging the lovely aromas that have been trapped in the bottle to come out. A good trick is to leave your glass on the table and, holding the stem, gently create a circular movement to get the wine moving around. Once you get a ‘feel’ for the weight of the liquid swirling around it will be easier to mirror this holding the glass in the air without fear of spilling! Next, tilt the glass and hold it up to your nose. Take a few sniffs and let your senses guide your imagination. Take a step back and repeat the process a few times until you’re conjuring up all sorts of lovely descriptions of what the wine smells like. Here, there a few tell-tale signs to look out for. Zippy limey, citrus, pear, floral and fresh cut grass aromas in a white wine will indicate a lively fresh youthful wine (think Sauvignon Blanc, Pinot Gris, and Riesling). Butter, toast and spice may suggest some oak influence (think Chardonnay). Honey, marmalade and quince might suggest a sweet wine or something with a bit of time in bottle. Fresh strawberry, raspberry and cherry aromas in a red wine might suggest something youthful, soft and juicy (think lovely young Pinot Noir or Sangiovese). Plums, blackcurrants and liquorice would suggest something a bit fuller bodied (think Shiraz, Cabernet and Merlot). Smoky, leathery, spicy and earthy aromas could suggest some oak but again could come from some bottle age (think all the above red varieties). Two things to be wary of are taints and faulty wines: sadly these can creep into even the world’s greatest drops. If a wine smells musty, of wet cardboard or generally unpleasant, there may be a fault. Thankfully, the modern-day producer has greatly reduced the number of faults in the wine world, but now and again these taints can spoil everybody’s enjoyment of what should be a nice bottle. The best policy being that if it smells bad, put it aside and reach for another. Now comes the time you have all been waiting for! As you become more comfortable with your tasting technique, it will make you think of wine like you may never have before. First up, take a sip from your glass and move the wine around your mouth so your whole mouth gets a sense of the wine. It’s now time for the important slurp, which brings air into the wine and allows the aromas to permeate, allowing you to you detect the flavour complexities. 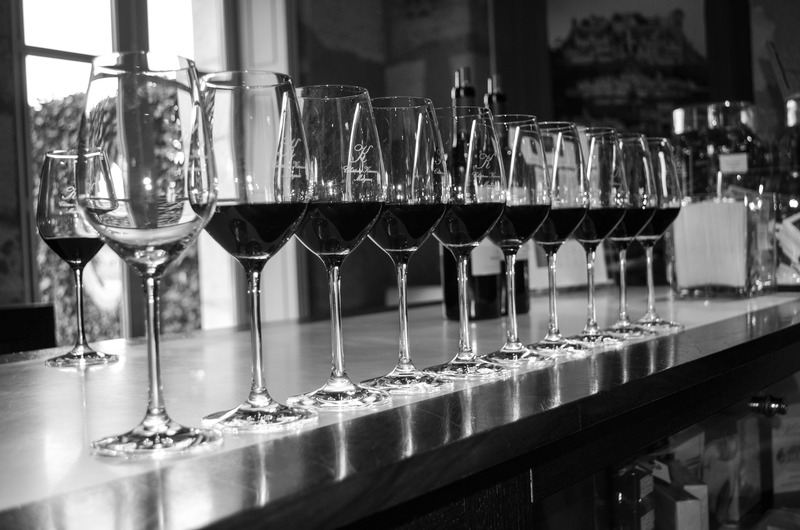 There are numerous things to look for in the taste test, but the key to all good wine is for all these different components to come together in one balanced, harmonious fashion so that the wine is a sum of all its parts. Remember, at this stage, you are still tasting and not drinking (the drinking comes later, don’t panic!). Have a spittoon or suitable bowel at hand so that once you have sipped and slurped, you can spit the wine out and start to assess what is in your glass. Sweetness/Residual Sugar: Sweetness is sensed on the tip of your tongue. If the wine coats the tongue and feels viscous and sensual there may be some residual sugar lurking. Wines with high residual sugar match up particularly well with desserts (and are some of the wine world’s truly greatest hidden treasures). Acidity: Acidity is sensed first on the side of the tongue, and without it, wines lose focus and become flabby and devoid of charm. A good way to gage the acidity in your wine is after you have projected the wine into a spittoon, hold your mouth open to encourage extra air. If your mouth begins to salivate, this is the acidity at play. Wines too high in acidity become austere and tough (think ‘battery acid’). But don’t be scared of acidity, some of the worlds greatest wines have it in spades, and it can charm and delight as long as it is balanced. Tannins: The world of tannins is a deep, complex and mystical place, but generally speaking tannins are mostly found in red wines (but can be found in some whites depending on style). Derived predominantly from the skin and seeds of the grape, tannins can also come as a result of oak aging. A wine with high tannins will grip and coat the gums and the middle of the tongue, giving a drying sense of bitterness and astringency. Tannins help enhance the texture of the wine, and when right, provide a framework that supports the rest of the wine as a whole. A good way to familiarise yourself with tannins is by thinking of cold tea and cranberry juice which have tannins in abundance. It’s important to note that different varieties of grapes exhibit different levels of tannin. Varieties such as Nebbiolo and Cabernet Sauvignon are inherently high in tannin, whereas thinner-skinned varieties such as Pinot Noir and Grenache tend to have lower tannin levels. Wines that have been specifically produced for consumption in their youth are designed to exhibit softer, rounder tannins to give a soft ‘mouthfeel’. Conversely, wines produced for longer ageing or cellaring tend to carry tannins which are more pronounced and need some bottle age to soften out and come into harmony with the rest of the wine. Alcohol: The final piece of the jigsaw is the alcohol. Wines too high in alcohol seem ‘hot’, and, if you sense a bit of heat at the back of your throat, then most likely the alcohol may be out of kilter with the rest of the wine. Again look for that magical balance where the alcohol seamlessly blends in with the sweetness, acidity and tannins to create one big glass of wine heaven. Once you are confident that all the parts of the wine are in balance it’s time to start thinking about the flavour, the body, the intensity and finish. Is your red wine rich and full bodied, exhibiting high tannins and lots of spicy oaky flavour that linger on the palate? Is it fresh, juicy and soft with lots of crunchy red fruit flavours? Is your white lively, crisp, delicate and clean with lots of citrus fruit? Is it fuller bodied with spice and honey? A wine with spades of everything with a long, lingering complex finish that compels you to conjure up a host of tasting descriptors, could well be built for the long haul, and might benefit from a year or two in your cellar before popping the cork. Something that is pleasant, fresh and simple is indicative of a wine you should probably sip up soon! Start to look at all the parts of the wine as a whole and try to match it to the occasion. If you are having friends over for a casual Friday evening and catching up over canapés, perhaps lean towards lighter, fruitier styles. If you are sitting down to a hearty meal, look for something a little more complex and challenging on the palate with richer flavours that match up to the weight of the dishes you are serving. Above all, wine tasting should be fun. If you follow these guidelines you will be well on your way to enhancing your enjoyment of the gift of Bacchus. Don’t get hung-up on the details, and if you don’t sense something you think you should, don’t sweat it: it’s all part of the learning curve. And really, where else can you learn while having so much fun? The magical world of wine is endless, and discovering new and wonderful varieties, and wines within each variety along the way is all part of the journey. It’s finally time to have a drink, so pour a glass and sit back in the knowledge you have made a great choice of bottle in front of you.